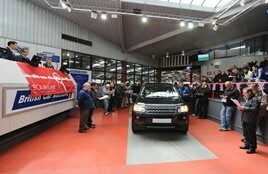 Halliwell Jones has agreed a new two year deal with BCA to remarket 3,500 vehicles annually at BCA Preston. BCA sells Halliwell Jones vehicles in a regular programme of sales every Monday and Wednesday at the Preston remarketing centre, with cars offered in-lane and via Live Online. BCA’s business development director, Emma Westhead, said: “Halliwell Jones offers a first class selection of desirable stock every week and all vehicles are pre-sale prepared and offered with a BCA Assured report, where eligible. Halliwell Jones has also deployed the BCA Dealer Pro system across the retail group, meaning every incoming part-exchange vehicle will be appraised and valued using BCA’s cloud-based service. Halliwell Jones’ sales director, Jim Houghton, said: “BCA combines great service and innovative technology to support our used car programme. The team at BCA Preston understand our business and go the extra mile to ensure we get great results. Halliwell Jones has retail centres in Chester, Southport, Warrington, North Wales, & Wilmslow, with both BMW & Mini brands, products and service at each location.